in RSMSSB Recruitment Notification 2018. Last date to apply online for this RSMSSB Physical Training Instructor jobs is 29-05-2018. Online mode of Application only accepted for this RSMSSB Physical Training Instructor jobs. Selection for this PTI Jobs recruitment is based on objective type written exam which consists of two papers. 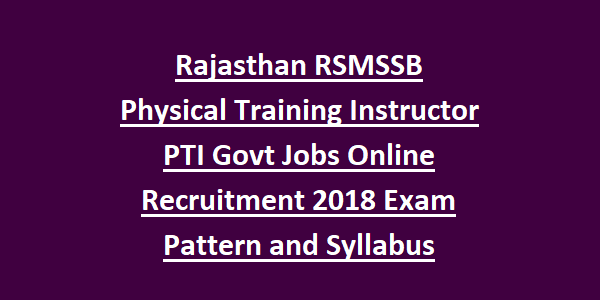 For more details like Exam Pattern and Syllabus, RSMSSB PTI online application form, selection process, eligibility criteria, qualification and other details of RSMSSB Physical Training Instructor Recruitment 2018 are given below. Click here for official advertisement of Rajasthan RSMSSB PTI Jobs Recruitment Exam 2018. RSMSSB PTI Jobs Online applications are available from 31-05-2018. Probable Exam Date for RSMSSB PTI Jobs is August 2018. There are total 4500 vacancies available in RSMSSB Physical Training Instructor jobs recruitment 2018. For the post Physical Training Instructor (PTI): Candidate must have qualified CPED or B.PEd or D.Ped from any recognized university for applying this PTI Jobs of RSMSSB. Upper age limit is 40 years for general male candidates. Age relaxations are applicable for Female candidate and SC/ST/OBC candidates as per RSMSSB or Rajasthan State Government Norms. Selected candidates will get Pay Scale of Matrix Level 10. Selection for these RSMSSB PTI vacancies will be based on written exam and physical fitness test. Written Exam consists of two papers. 40 Marks will be given for the candidates who are participated in tournament or sports meet. As per requirement physical tests will be conducted by selection committee. 1. Paper 1 Exam will be conducted for 200 marks. 2. Exam Duration is 2 hours. 4. Each question carries two marks. 1. Paper 2 Exam will be conducted for 260 marks. Application fee for General, Creamy Layer BC/MBC candidates is Rs.450/-. 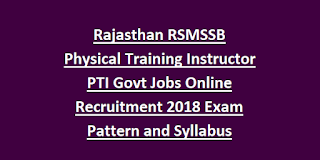 Candidates who are having the above given educational qualifications and within the age limit, they can apply online for this RSMSSB Physical Training Instructor jobs on or before 29-06-2018 through www.rsmssb.rajasthan.gov.in/. Exam Pattern and Syllabus, Admit Card, result and other details are given in this website only.